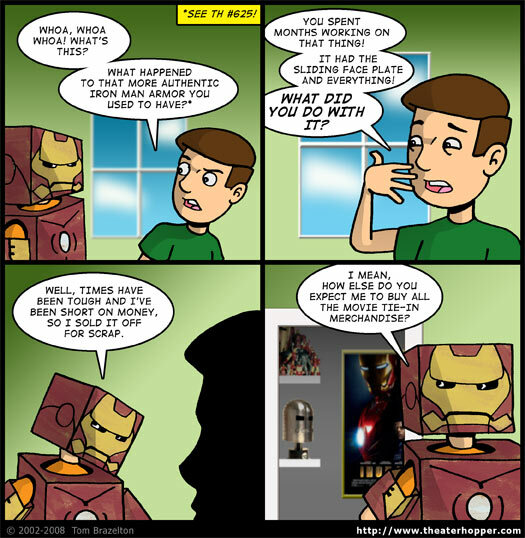 Since slapping Tom into a crudely made homemade Iron Man costume, I felt obligated to return to a one-off comic I did two years ago when the Iron Man movie was first announced. It lined up well with the Halloween holiday and I thought, eventually, I might return to it. Then I thought it would be funnier to have Tom in a cardboard outfit than a fully functional piece of high-tech armor. Plus, have you seen how much those Iron Man movie action figures cost? Stuff gets expensive! I was going to take a picture of all of the Iron Man comic books I own, but I wasn’t feeling very well yesterday and it slipped my mind. Let’s just say that they number in the 200 – 300 range. While we’re on the subject of collectibles, I just wanted to say THANK YOU to all of the people that immediately contacted me last week offering to purchase that awesome Jesse Phillips poster for the advanced screening of Iron Man at the Austin Drafthouse Cinema Lamar. Also a big THANK YOU to those who have offered to send me all the cool Iron Man promotional items from 7-11. I have to admit, I’ve been a little overwhelmed by the response and I haven’t gotten back to any of you yet. I feel terrible about that. So I’m going to collect all of the e-mails and sort through them this evening and try to get back to all of you tonight or tomorrow. I honestly didn’t think anyone even read this blog stuff anymore! So it was really cool to see that not only do you guys read my entries, but you’re so willing to enable my addiction to all things Iron Man! I found out last week that my local theater is selling advanced tickets to Iron Man starting at 8:00 PM Thursday night. I was flirting with the idea of doing the midnight showing on Friday (and even going so far to call in sick to work the next day so I could watch the movie over and over! ), but then I decided not to push my luck. An 8:00 PM showing of Iron Man would be handy, but I also have Friday’s strip to finish. So I’m trying to decide if I’ll attempt to work in advance and have the strip done before Thursday so I can see through the storyline OR if I’ll take advantage of the early showing, come home and do a REACTION strip for Friday? Or, there’s a possibility that I won’t go to Iron Man at all on Thursday. *GASP! * I KNOW!!! The reason for that is because I really want Cami to see the movie and it kind of ruins the experience a little bit if I’ve already seen it and then start jabbing her with my elbow every five minutes saying "Check it out, check it out, check it out!" At any rate, that’s about all I have to share this morning. But don’t forget to carve out some time this evening to listen to The Triple Feature talkcast at 9:00 PM CST over at TalkShoe.com. Tonight we’ll be talking about Baby Mama and Harold and Kumar Escape From Guantanamo Bay. Meanwhile, both Joe and Gordon will attempt to steer me away from all topics related to Iron Man – since I have a one-track mind. Whoa, whoa whoa! What's this? You spent months working on that thing! It had the sliding face place and everything! Well times have been tough and I've been short on money, so I sold it off for scrap. I mean, how else do you expect me to buy all the movie tie-in merchandise?